Istanbul's central area of Taksim is currently the scene of a fledging 'occupy movement' as people react to this morning's 5am teargassing of protestors opposed to unchecked gentrification in the historic city. These are some cursory notes on whats been unfolding in Istanbul's central square Taksim and the small green area within in - Gezi Park, as of Friday 31 May there is still little English language coverage, the best place to look is #occupygezi or in Turkish #direngeziparkı which is trending worldwide. Along with a lot of information in Turkish there are quite a few Tweets pointing at the environmental nature of the protest with tree-saving and maintaing green space in an over urbanised city as the key issues. This is only the tip of the iceberg. The recent wave of violence released by Turkish police under the rule of Recep Tayyip Erdoğan's AKP ([url=http://en.wikipedia.org/wiki/Justice_and_Development_Party_(Turkey)]Justice and Development Party[/url]) government including this morning's tear gassing of protestors is in fact a growing trend which many are worried as seeing Turkey slipping further and further into authoritarian rule. Since the annual May 1st demonstrations violence used against protestors has intensified in Istanbul as people have taken to the streets to decry the worrying trends they see developing in their country. This is reflected around the country with attacks on university students in Ankara coupled with a rapidly destabilising situation in the South East as the Turkish border areas are dragged into the Syrian conflict. Back in Istanbul years of rapid neo-liberal gentrification under the guise of urban improvement has seen swathes of the city transformed. Most recently the go ahead was given for the third Istanbul bridge which is due to see the city transform into an enormous monster spreading up towards the black sea. Many commentators see this as the death knell for Istanbul. In the city centre the central working class neighbourhood of Tarlabasi is currently being decimated while projects such as Galataport and the redevelopment of the Kadikoy train station see historical parts of the city flattened and redevelopment as global investment opporutinites leading to soaring prices and the replacing of large parts of the city with shopping malls and luxury apartments. In Taksim square, Gezi park (hardly a park by European standards but more a huge traffic island made of of concrete with several hundred trees sitting in its midst) sees itself as the latest victim of a government which deploys heritage as an argument for redevelopment as it drags from the dust the idea of an Ottoman Army Barracks which suddenly must be developed as a shopping mall, replacing one of the last remaining open spaces a city which is already struggling to breathe from congestion, traffic and over development. Scene of protests for the last few days this morning saw police attempt to clear protestors with swathes of tear gas, hospitalising some with an attack which started at 5am while many were sleeping in a makeshift camp. Protestors belongings and tents were burned and newly planted trees uprooted. At 8am this seemed to cease as opposition politicians seeking to make political capital declared opposition to the ongoing destruction and arrived among the bulldozers. Meanwhile a gathering has been called Thursday night in Taksim square at 19:00. This is a super rushed account of what's happening and doesn't take into account many of the factors which play into this complex story, hopefully by tomorrow some more English language accounts will be coming out of the city with better analysis. As of Friday 31 May I am trying to update the story with links below. 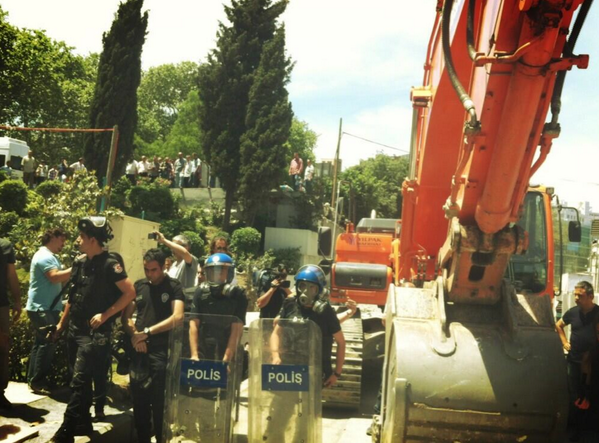 For the last few hours this has been trending worldwide at #direngeziparkı. The picture today seems much the same, campers awoken by teargas at 5am before repeated eviction attempts with numbers swelling this morning, keep an eye on #direngeziparkı and #occupygezi. Twitter reports coming in as of Friday afternoon that Turkish Police have killed a man in the square after he was hit with a tear gas canister and suffered from a heart attack. Interestingly nothing I have seen online so far seems to suggest that anyone is particularly fighting back or resisting the police in any way, certainly not organised. It is also said that there are plans for the construction of a new mosque, which would brazen in its to appeal to the voters of a party that has built itself on coupling conservative social policies with liberal economics. In those terms then, the struggle over Gezi park is a microcosm of a much broader battle; it is about keeping trees in the city but its roots are much deeper. Taksim Square is one of Istanbul’s few public spaces, and the heartbeat of its anti-establishment politics. In 1977, amidst the hostility of the Cold War, right-wing militias opened fire on a May Day demonstration and killed thirty-six protestors. Ever since it has been home to mass mobilisations and confrontations. There is conflict in Ankara as well. About 3.000 protester pushing the barricades. Galatasary and Fenerbache fans also uniting and helping out. Apparently 400 people were detained and ultrAslan (Galatasary fans) saved them. The latter were/are? currently trapped in some sort of tunnel (photographs and here they are earlier on in the day]). Solidarity from Manual Fernandes and a Fen. player whose name I've forgotten. This is apparently a government building on fire (I assume in Istanbul?). There's also some great photos doing the rounds of thousands of people streaming across one of the (non pedestrian) Bosphorus bridges. Seems to be escalating. It does seem to be escalating and spreading quite a lot. I have seen reports of demonstrations in Ankara, Izmir, Zonguldak, Konya, and Izmit. There has been a court decision to delay the building work in Istanbul, but it doesn't seem to have any effect in quieting things down. And Eskisehir, Antalya, Kutahya, Kayseri, Afyonkarahisar, Manisa, Nazilli, and Marmaris. Resistance continues. Sadly it's not revolutionary enough. But it's something. Those pictures are on a few sites though, and the people don't exactly look dressed for a marathon. All of my friends i Turkey reported that they have never seen something like that. Popular support to the demos are unbounded. The clashes have continued all day in major towns yesterday and growing. could you please keep us updated with developments? And encourage other people in Turkey to post here letting us know? Police have retreated from the Taksim square. This is a huge moral victory. Since 1980 military coup police have never retreated. According to some rumors facebook and twitter is blocked. The turkish media is completely silent. 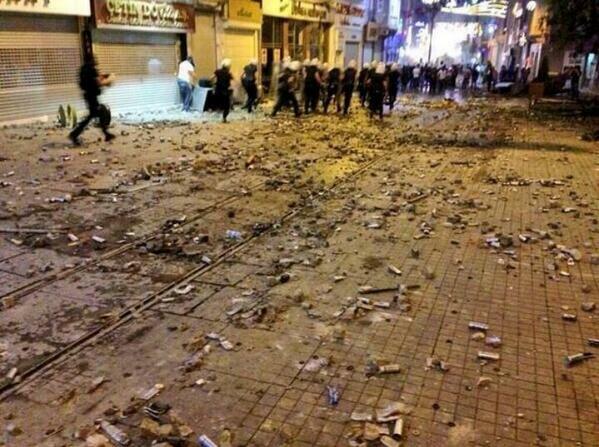 The clashes are still going on in Ankara and other major and minor towns. EDIT: It is almost certain that twitter and facebook is blocked.